The Linds EXXXTRA 2 shoes are made with quality and performance in mind. These shoes include Linds VHS II technology which allows the bowler to adjust their approach with removable cleats rather than changing the entire sole or heel. 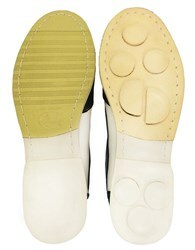 The lining of these shoes is fully US Leather and has antibacterial leather footbeds. Unfortunately the left handed version of this shoe does not come in a wide width. Hi Bob! 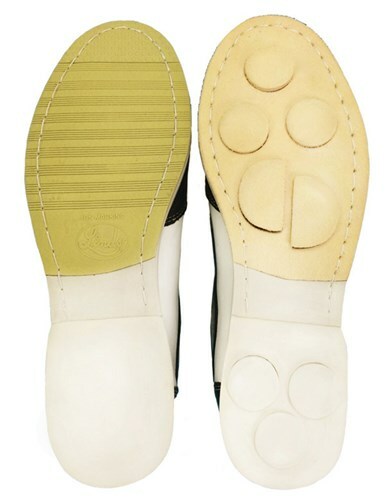 It looks like the left handed version of this shoe does not come in a wide width. At this time, we only have size 9 available. Has this shoe and the CPV been discontinued by Linds? Yes, Linds is currently still making the rental style shoes and the Classics only. This shoe and the CPV are discontinued. 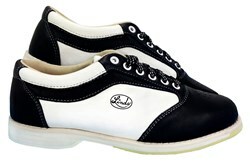 Due to the time it takes to produce the Linds Mens EXXXTRA 2 Black/White Left Hand ball it will ship in 3 bus. days. We cannot ship this ball outside the United States.